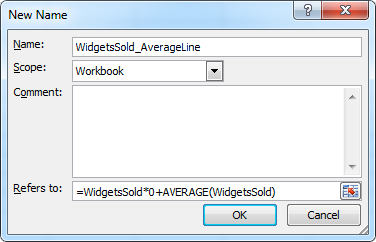 Now, the classic way to do this is to add a new column to the underlying data, put a formula in that column to calculate the average and repeat it in every cell. 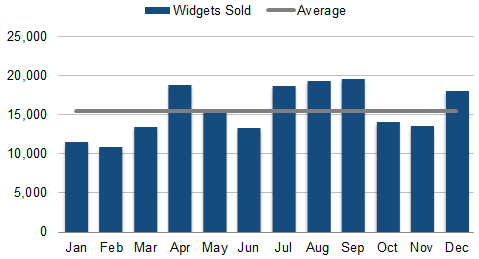 Then, simply add that data to the chart (a clustered column chart), select the average column and change the chart series type to be a line and “Voila!” there is the chart. But…50 metrics…built on multiple tabs of underlying data from different sources…that were relying on pivot tables and clever formula-age to change the timeframe, data granularity, and trend length… and my head started spinning. That was going to get messy! So, I figured out a way to accomplish the same thing without taking up any additional cells in the spreadsheet. It’s the second step that is either a brilliant piece of baling wire or a shiny piece of duct tape, but no amount of Googling turned up a better approach, so I ran with it. If you know a better way, please comment! Let’s break it down to a bit more detail. Because the average line named range is based solely off of the named range for the chart itself, it’s pretty robust — no matter how complex and dynamic you make the base named range, the formula for the average line named range stays exactly the same. 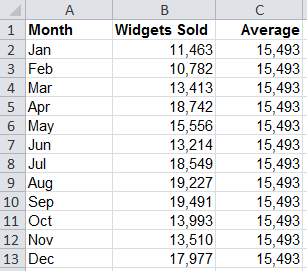 Having said that, in my dashboard, I actually made the formula a bit more complex, because I didn’t want to include the last period in the charted range in average (e.g., if I was viewing data for October and had data trended from June to October, I only wanted the average to be for June through September). That’s a pretty straightforward adjustment, but this post is already long enough! This example was for the average, but, what if, instead, you wanted to plot a target line, where the target for the data was a fixed number? The same approach applies, and you’re not stuck duplicating your target data across multiple cells. What do you think? Do you have a simpler way? You can used named formulas (“Names”) in Excel worksheets and charts. Named formulas are clever, dynamic, and flexible. Names are also hidden, “magical.” and hard to create, modify, understand, and maintain. In 6 months, try to recall how your Name works. Or someone else’s. Try to explain Names to the Sarbox auditors. 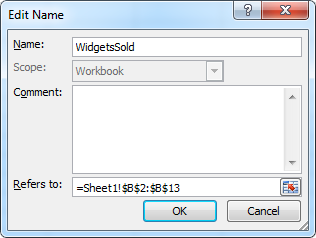 Using worksheet space (“helper” columns) is cheap, fast, visible, traceable, easy to work with. Whenever possible, limit use of Names to those that reference regions of the worksheet. I take it back, not sure my solution would work. So, i’ll be referencing this in the future. Thanks! The only simpler way I can think of is to cheat altogether and use a platform like Tableau Software. It’s where we run the majority of our heavy lifting dashboards. What’s your thought on doing the tried-and-true way through Excel vs. fast-track with Tableau? Am I depriving myself and my team valuable knowledge of the inner workings of Excel? Clever. I wouldn’t have thought of trying to build an “array” that way, or that it would even work like that. Now I have to go in and play around with that concept, to see what other devious ways it could be used. Great guide!!! Thanks a lot!!!! reading it, you can bee a great author.I will ensure that I Ƅookmark your blog and wilol come back at some point.I want to encourage one to continue your great ԝriting, have a nice day!